All of our teachers have been trained through the international organization: Suzuki Association of the Americas. Read more about Dr. Shinichi Suzuki and check out Summer Suzuki Institutes. To be an enrolled student in PBSSM, the student must study an instrument with a PBSSM private teacher and regularly attend PBSSM group class. Private lessons are given Monday through Friday regardless of the one day holidays, early release days, teacher work days, etc. 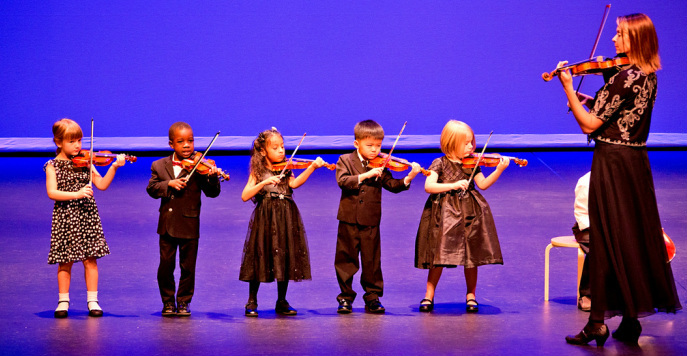 Every student is assigned to a group class to match their instrument/ability level and age. Group classes include the opportunity to play solos in front of peers, work on artistic and technical aspects of the Suzuki repertoire, develop ensemble skills, general technical skill, prepare for solo and group class performances, music theory/aural skills, and reading of supplemental music. Group classes for all students meet on Saturdays (late morning to early afternoon). See Saturday Schedule Tab on the website. The commitment to group class is as important as attending private lessons. 2 or more absences (including arriving late/leaving earl) causes serious concern and will affect the opportunity to re-enroll for the next school year. Intermediate and Advanced piano students have a wonderful opportunity to accompany string students or be a part of chamber ensembles. Seasonal Ensembles form for different events such as the Annual Spring Showcase and the Annual Christmas Sing Along. Orchestras will also form to specifically prepare music for certain events. Melodica Ensemble is consisted of piano students who are given the opportunity of playing in an ensemble with their peers. Once a month, students that are well prepared perform in a recital of soloists of all ages and instruments. All of our soloists speak extemporaneously to introduce their piece to the audience and are accompanied by one of our piano faculty members. All of our recitals are at 11 am at Memorial Presbyterian Church. Our performances are open to the public and are free. We recommend that even if your child isn't performing, they still attend all concerts. Dr. Shinichi Suzuki led a life of true “giving” and he has inspired many children and teachers around the world to do the same. The most valuable thing that we can give back to our community is our music. We choose to share our music in all interesting settings: Lake Worth Halloween Parade, retirement home in West Boynton Beach, an outdoor amphitheatre at Irish Fest, at Hospice on 45thst., on bandstands in the downtown areas, and at the Palm Beach Zoo. After all of our hard work throughout the year, here is a special opportunity ti see every member of our large and growing Suzuki community performing on a professional stage. We will be performing at Bak Middle School of the Arts Main Stage. We have selected student soloists, orchestra, chamber groups collaborating with community groups (Ballet and Tango) and a play-in of our entire school! It is quite a special event for our school and one not to be missed! This annual celebration is a showcase of solos and duets prepared by our piano students. Every piano student performs at least one mastered piece along with duets or chamber ensembles. In the beginning of year, each studio collects $6.50 from each family for membership dues to SASF. This is our local Suzuki Association from which much gets organized on a much larger scale as it covers South Florida (both coasts and the Bahamas) as well as for the purposes of: teachers, parents and students. Some of the biggest events organized are Suzuki Workshops, Suzuki Graduation Recitals and the Annual Meeting. Our school has nearly 100% enrollment in the SASF workshops (2 per year). Workshops are highly motivating events for parents and students and held over a 2-3 day weekend. SASF invited two nationally recognized Suzuki registered Teacher-Trainers to work with our students in group classes and master classes. PBSSM faculty and all “Suzuki” teachers should be members of our International Association. Go online to the teacher locator to look up your teacher’s credentials. We are registered for each Suzuki book. This association offers one of the best quarterly journals! It is a tremendous resource for teachers and home-teachers. If you become a member, you can get the journal as well as access to Parents as Partners, an online chat group for Suzuki parents, and much more! Most importantly, SAA hosts Suzuki Summer Institutes all over the U.S. during any week of the summer for all instruments and ages. These one or two week institutes take place on college campuses with all families living together in dorms and eating at the cafeteria. It’s like the workshop experience except each day is a master class, with two different group classes and supplemental classes. There’s plenty of recreational time as well as fun organized events to attend in the evenings.